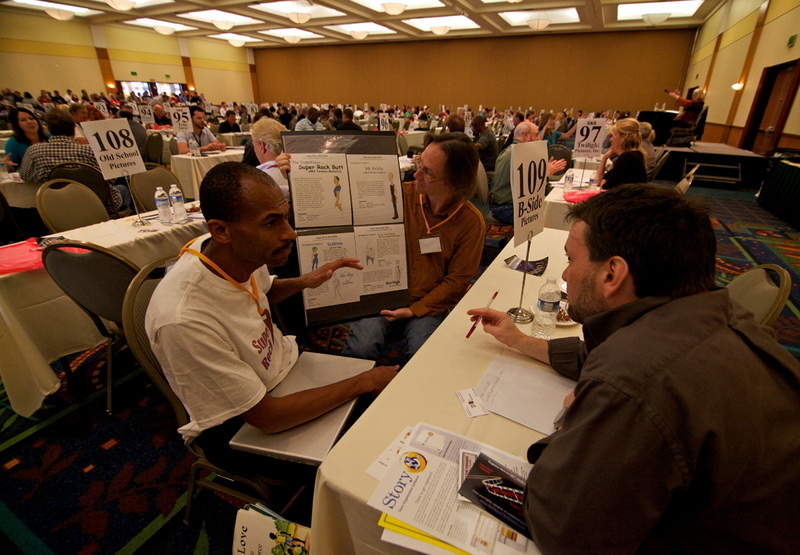 What I did at Camp Hollywood « "TeresaBruceBooks"
They say screenplay pitch festivals in LA are a lot like speed dating. Not having tried seducing anyone before a five-minute buzzer cuts me off, I can’t actually vouch for the analogy. But there was a woman with a cow bell. Literally, at the Great American Pitch Fest in Burbank Sunday, a 50-something woman presided over a cavernous convention center hall with a cowbell. Which she rang, with Christopher Walken enthusiasm, every five minutes, for six hours. You’d think, given that her job was to keep five hundred would-be Nora Ephrons and Judd Apatows moving right along, she would signal your time’s up with the clap of a sync slate. Or a flashing red applause light and canned clapping. But the cow bell was the perfect cue. We were, afterall, being herded — shuffled out a side gate to what organizers affectionately called the bull pen, to wait in line to do it all over again. Waiting in line was the most entertaining part. It’s where I met a woman from Texas, I’ll call her Lanky, who wasn’t satisfied pitching her epic to the 120 production company execs there to listen in five-minute increments. She had to pitch me too – how the one true God was still to come and we’re all just circles of light waiting to receive the signal. I think her movie was the signal, but I didn’t really want clarification. Then there was the couple in their sixties who carried around a miniature Siberian all day. I had to ask. The dog was part of the pitch. Again, no need to know more. Those lines were long and once a conversation like that starts it’s hard to stop. I liked the whisperers the best. Nervous writers, mostly from other parts of the country, who kept reciting their pitches to themselves in line. This is when you’d think blue-tooth headsets would be a good disguise. Except when you still whisper. Kinda gives you away. Like the woman from North Carolina, who bonded with me because we’re both from states that end in the word Carolina. She looked nervous, so I told her she looked like Isabella Rossellini. She told me that her screenplay was a riches-to-rags story, about how she and her apparently unlucky husband had to leave New Jersey and wound up in the sticks. (Charlotte – her description, not mine) Then she took a cell phone call from her husband, who told her that her whole church was praying for her. Right at that very moment, three time zones away. I really felt for the couple from Japan pitching an animated short film. Which they’d already made. What they needed was distribution, and maybe a translator who could have explained they were playing in the wrong sandbox, wasting their time and energy. They looked dazed and disappointed, like I’m sure I did at my first pitch fest, when I found out that nobody in Hollywood wants to buy dramas unless they’ve already been a best-selling novel. “But what about all the Oscar nominated dramas?” I sputtered – back in October. Then I checked. They’re always adaptations. Turns out my first two screenplays are destined only for “good-for-you” film festival awards. This pitch fest was more productive. I took what I learned at the first one, swallowed my pride and spent the next four months creating something commercial. Which also turned out to be way more fun – both to write, and pitch. I had no trouble describing my R-rated, female-lead comedy, called “Free Corona,” before the cow bell rang. Although now that I’m back home I keep wondering if I should have had an actual Corona in my hand. Or better yet, one for each of the patient executives who had to listen to Lanky’s epic before they got to me. R-rated comedy and free beer … maybe that writer from Charlotte would have sent some prayers my way. This entry was posted in travel and tagged Photos, R-rated comedies, Screenwriting, The Gold Company. Sounds like SO much fun! . . . Hours and hours of this . . . I just cannot imagine…. and I’m of an age sufficient to have as the first thought arising after seeing the word “Corona” – – – “typewriter”! Now, of course, those whose ken includes “typewriter” are fewer and fewer. I’m with you, Will! But I actually knew an icy cold beer might have made quite the impression. Teresa, this was fun to read. Your dialogue fits the Dave Barry criteria: “I’m not making this up!” Thanks for taking us there, and I look forward to your update that tells us, It’s SOLD.” . Guess what? I got a fever! and the only prescription is more cowbell!